Viber - Free Phone Calls is an iPhone application that lets you make free phone calls to other iPhone users that have Viber installed. When you use Viber, your phone calls to any other Viber user are free, and the sound quality is much better than a regular call. You can call any Viber user, anywhere in the world, for free. All Viber features are 100% FREE and do not require any additional “in application” purchase. NO HIDDEN COSTS: Once you and your friends install the free Viber application, you can use it to talk as much as you want. Talk, talk, and talk some more and it is all free. 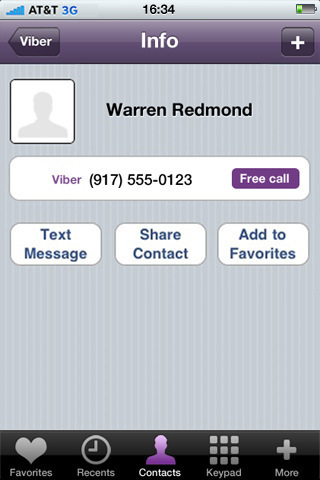 Just makes sure all your friends get Viber! All you need is an Internet connection: 3G or Wi-Fi where available. NO INTERNATIONAL CHARGES: It doesn’t matter where you or your friends are, be it on the same network or in a totally different country. You can talk for as much as you want, for free. Just make sure your friends have Viber too. COMPLETELY FREE AND WITH NO ADS: Viber and all Viber features are absolutely free and do not require any additional “in application” purchase. On top of that, Viber doesn’t contain any annoying ads. NO USERNAMES, PASSWORDS OR REGISTRATION: You know your friend’s phone number, so why bother with yet another username and password? Viber uses your phone number as your “identity” and lets you make free Viber phone calls to any of your friends that have Viber – using THEIR phone number. 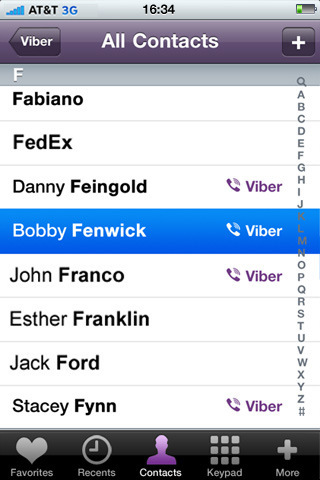 NO BUDDY LIST: Viber automatically highlights friends in your iPhone’s address book that have Viber. That way you know who you can call for free! CALL ANYONE WITH VIBER, NOT JUST YOUR FRIENDS: Want to dial a number and don’t know if they have Viber? No problem, make the call with Viber and if they don’t have Viber the call will be made using your regular phone - but don’t forget to invite your friends to Viber so your next call is free. 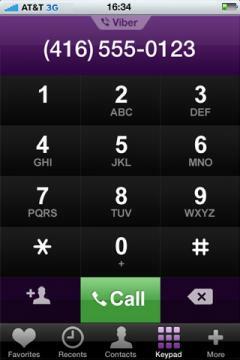 YOU CAN ALWAYS RECEIVE A CALL ON VIBER: If your phone is ON then so is Viber. Always ready to make and receive phone calls. No need to log in, or “go online” to receive a call. NO NEED TO ADD BUDDIES: Unlike applications like Skype, Windows Live Messenger or Fring where you need to “add buddies” and have them approve you, Viber behaves just like a phone. Just like you do not need to “add” someone in order to call them, you do not need to add your friends in order to call them on Viber. If you know their phone number, then you know their Viber number, and you’re ready to go! 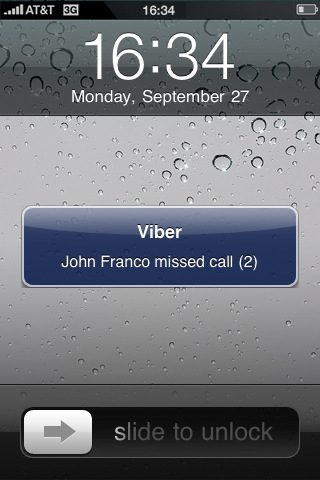 MISSED CALL NOTIFICATION: Even if you missed your Viber call because your iPhone was off, or there was no service, Viber will notify you of your missed calls as soon as service is restored. SOUND QUALITY: Viber uses state of the art technology in order to make sure the sound quality you get is much better than GSM or a regular phone call. how can i download viber to my ipadmini+cellular? please help me how to download viber.